Justinian I (born 11 May 483 and died 13 November 565) was a Byzantine emperor who reigned from 527 to 565. He was one of the most important rulers of the late antiquity. He is above all known for originating a group of very important laws, the Code of Justinian, which regulated life in the Byzantine Empire for centuries, and strongly influenced Europe in Medieval times. Justien also increased the territories of his Empire during his reign, for he tried to reconstruct the Roman Empire as it was in the second century. On the religious front, he has also played a great role, trying to unify the Christian beliefs but also to impose his views on the Pope. Justinian (Flavius Petrus Sabbatius Justinianus in Latin) was born in Illyria on 11 May 483, in the city of Tauresium. He came from a fairly modest family of Roman culture. He was the nephew of a soldier, Justin, who had so much military success that he became an emperor in 518, under the name Justin I.
Justin I took Justinian under his wing to involve him in his business. Justinian was then named patrician, and then consul. When his uncle died, in 527, Justinian became Emperor under the name Justinian I. In 523, Justinian married an actress, Theodora, who then became Empress. She had a large amount of influence over him. Justinian has great qualities to be emperor: he has a sense of the state, it is capable of much work and lives fairly simply. He also had much artistic and religious knowledge. Justinian was also able to take men of quality as advisors to, which would allow him to have a very important reign. Justinian died on 15 November 565, after naming his nephew, Justin II, his successor. Justinian's reign marked the transition of the Roman Empire to the Byzantine Empire east of the Mediterranean Sea. Justinian dreamed of recovering the greatness of the Roman Empire, but this had disappeared beginning in 476, in part because of the Germanic invasions. He will therefore, while expanding his empire, focusing on its eastern side, and make it stand on its own. Justinian wanted to recreate the Roman Empire around the Mediterranean Sea. He thus began by making peace with Persia, in 532. This left him free to carry out conquests towards the West. He attacked the Vandal Kingdom, in North Africa, and defeated it in September 533. In liberating the Mediterranean from Vandal ships, this allowed him to conquer Corsica, Sicily, and Sardinia. This conquest was often threatened by other kings, notably the Ostrogothic kings, but Justinian managed to maintain control of Italy throughout his reign. Taking advantage of the quarrels between the Visigoth leaders in Spain, he secured Baetica (modern-day Andalusia). The war had resumed with the Sassanid Persians, but Justinian signed a new peace in 562 allowing him to expand his influence in Armenia and in the Caucasus. Justinian was the last emperor to try to reunite the two parts of the former Roman Empire. But the wars had been very costly. Therefore, his successors, while not giving up the title of Roman Emperor will not seek any more to take military control of the whole Empire, which will gradually lose territories. Progressively, the empire shrunk back down to the Greek world. The Byzantine Empire was already wealthy when Justinian became Emperor. He was thus able to begin reforming the laws. He asked his advisors to bring order to the laws, in particular the edicts that dated from the reigns of Emperors Hadrian and Diocletian. This reorganizations produced a set of laws, at the time called Corpus Juris Civilis (in Latin), which is known today as the Code of Justinian. This code was written in 529. It was written in Latin, the official language of the empire. He also published a modernization of ancient Roman jurisprudence, called the Digest in 533, and a manual for teaching law, called the Institutes (at 533). The new laws that Justinian wanted were written in Greek, and are known as the Novels. They date from after 534. 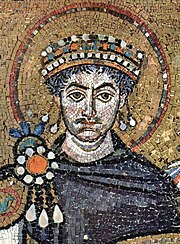 In addition to this reorganization of the laws, Justinian wanted to change and modernize the way the empire functioned. He groups together some provinces, change the ways the Empire function, and often let the provinces be governed by the military to maintain order. His government was very authoritarian. Justinian considered himself to be chosen by God. He wants to rule the Church in exchange for military protection it gives against the heresies. He was a true Christian. For him, Christianity was a state religion, meaning that all of the empire's inhabitants had to be Christian, and that he had the right to decide what was good for the Church. He thus passed regulations on the role of priests and bishops. Justinian tried to fight the pagans. He banned the worship of pagan gods in Anatolia. He also tried to reconcile various Christian groups, who had separated from one another for theological reasons. He fights especially against monophysites Christians. He sometimes had a tendency to oppose popes. Justinian's empire was very wealthy, due to the destruction of the Vandal Kingdom, which decreased piracy in the Mediterranean Sea, and thanks to Justinian's conquests. Byzantine merchants were able to conduct trade throughout the Mediterranean world. There was active trade between Gaul, Italy, the North African coasts, Egypt, and Syria. With the Kingdom of Ethiopia as an intermediary, Byzantium also traded with China via the Silk Road. All of this wealth permitted the development of a significant cultural life. Justinian and his wife Theodora sought to recover the greatness of Ancient Rome. Hymns (a type of religious poem) were composed to glorify the Emperor and Christianity. Artists were invited to enrich and embellish Byzantium and other cities in the Empire. Justinian and Theodora are depicted in their imperial adornments, with great figures from their court, by two famous mosaic panels in the basilica of Ravenna. Justinian is known for having profoundly reorganized the city of Byzantium. Justinian was first great builder. He ordered the construction of the Hagia Sophia in Constantinople (Byzantium's other name) (dedicated to divine Wisdom, or "Sophia" in Greek) with the aid of 2 architects, 100 master builders, and 10,000 workmen. It was built between 532 and 537 by the architects Anthemius of Tralles and Isidore of Miletus. The first cupola having collapsed in 558, a second was rebuilt in 562. Throughout the empire, Justinian financed the construction of cities, bridges, thermal baths, and roads. This page was last edited on 30 March 2019, at 04:10.